Article number: MS Red Courtyard Dress-Colour-44"
Courtyard Chanel Red Velvet Dinner Dress, Cour de Rohan, 1955. 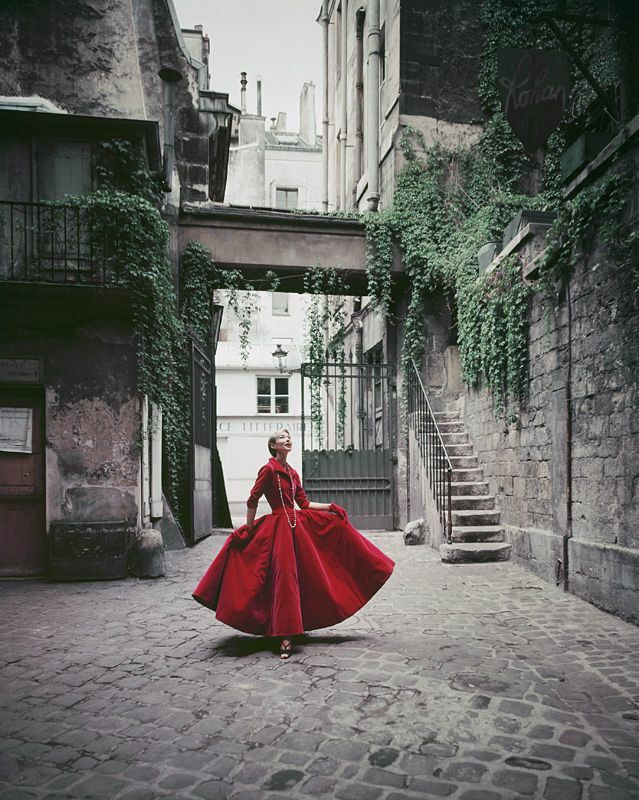 A velvet dinner dress by Chanel, is photographed in the vine hung Paris courtyard, Cour de Rohan, in 1955. The source for this image was a 4” x 5” vintage color transparency. The approximate printed size of the image in inches will be 10” x 12.8” (11” x 17” paper size), 16” x 20” (17” x 22” paper size), or 22” x 28” (24” x 36” paper size.) The 44” Series approximate image size will be 40” x 50” (44” x 54” paper size.) Note: Sizes are approximate since some images have been cropped in keeping with Mark Shaw’s original vintage prints of this material. The 24" X 36" version of this image is only available in an edition of 15. Mark Shaw is best known for his photographs of Jacqueline and John F. Kennedy, which he shot originally for LIFE magazine and later as the Kennedys’ “unofficial” family photographer. He developed a strong friendship with JFK and Jackie and regularly visited the White House during their time there. But Mark Shaw was first and foremost a Fashion and Advertising photographer whose freelance assignments for LIFE magazine had him photographing some of the most notable celebrities of the 1950′s. All Mark Shaw prints are made to order in limited editions on Hahnemϋhle photo rag paper. Each print is Estate stamped on the back and signed and numbered by David Shaw, and accompanied by a letter of authenticity. For all enquiries or to place an order, please call our store on 02 83569999 Delivery approximately 4-6 weeks. *Please note this image is available in 4 sizes. Final pricing is subject to confirmation from the Mark Shaw Photographic Archive as changes may occur as editions sell out. As a result, this item CAN NOT be purchased online. BECKER MINTY is the exclusive Australian representative for the Mark Shaw Photographic Archive.